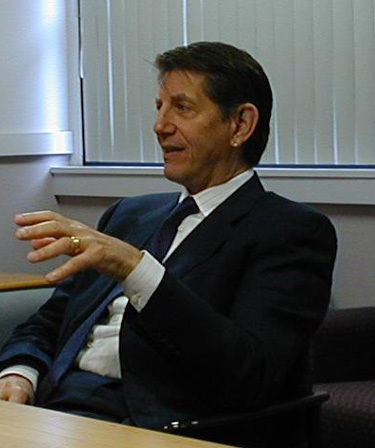 Cannes, France, May 20, 2004 (UPI) - Actor Peter Coyote will star in back-to-back sequels filmed in Romania of Return of the Living Dead, producers announced at the Cannes Film Festival. Anatoly Fradis' Los Angeles-based Aurora Entertainment Corp. will begin shooting Return of the Living Dead 4: Necropolis and Return of the Living Dead 5: Rave From the Grave, June 7, said Thursday's Hollywood Reporter. Both films, directed by Ellory Elkayem, were written by William Butler and Aaron Strongoni and will have special effects done by Optic Nerve Studios. They are financed by a $35 million equity fund started last year by Fradis, who made Eight Legged Freaks. The fund is based in America but backed by a group of private Eastern European and Russian investors. 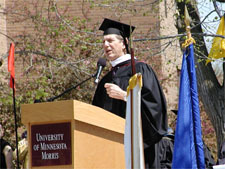 On Saturday May 8th, Peter was the commencement speaker for the graduating class at the Morris campus of the University of Minnesota. Needless to say, his message was "Activism can still work"! It was truly an outstanding address to give a graduation class. Very personal, relevant and inspiring. Enjoy and read his entire commencement speech! The Prairie Renaissance Cultural Alliance also hosted a reception for Peter at their Cultural Center in Morris later that day. The public was invited to hear him read from his own writing. The almost 400 graduates of the University of Minnesota-Morris might not have realized it, waking up to a beautiful prairie spring Saturday, that unless they become even more engaged in political and public life, the rest of their mornings might not be as contented. 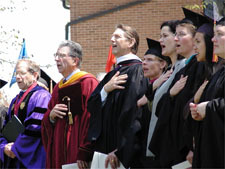 Actor and social activist Peter Coyote reminded them as such as the universitys Commencement speaker. Coyote, known for his work in films such as E.T.-The Extra-Terrestrial, Erin Brockovich and Jagged Edge, is foremost an agent for awareness and change in American politics and society. "If students dont become engaged in the political process, theyre going to wind up in a world that theyre not going to like, that is run according to other peoples interests. And they are the only hope to change it." Coyote graduated from Grinnell (Iowa) College with UMM Chancellor Sam Schuman and his wife, Nancy, 40 years ago this month. A smiling Coyote admitted he couldnt remember his own graduation speech, or even the gender of the speaker. But he surmised that, based on other speeches he read while researching his UMM address, it likely contained references to moving from childhood to adulthood and some suggestions for handling the transition. Coyote wanted UMMs graduates to realize that transition to accomplishment is a continuing process. "I never gave up," he said. "I never stopped staying engaged and working for political change. So Im passing that message on, maybe as it was passed on to me, but as someone who didnt quit. A lot of the people who pass on those messages are part of the problem, as far as Im concerned." Coyote isnt a handsomely wealthy and famed actor who associates with causes as a means to garner more publicity. He spent his early life in the San Francisco area working for political and counter-culture causes in the 1960s and 1970s, much of which is chronicled in his 1998 memoir Sleeping Where I Fall. 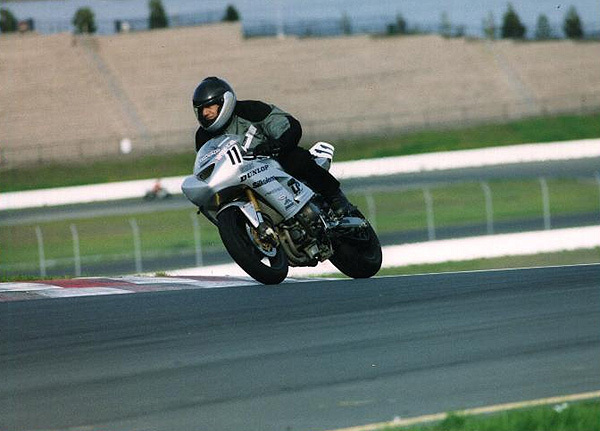 He later served on the California State Arts Council, and still is involved in numerous artistic groups and organizations such as Baykeepers, which tracks pollution and other problems of San Francisco Bay. Coyote also was a delegate to the 1997 Democratic National Convention and covered the event for Mother Jones magazine. Through it all, he said hes sensed a struggle in the U.S. and its "civic center" of political and public institutions and life. Wealth and corporate culture dominates this "civic center" and has worked to keep the citizenry disenfranchised to maintain their status quo and counter the desires of a majority of Americans for changes in health care, environmental and defense issues. "(Corporate leaders) are calling the shots," Coyote said, "and the only hinge, the only gate by which the citizen can access it is through the vote. And 50 percent of the people dont vote. "These people who are controlling things, its in their interests to have a disenfranchised citizenry and they keep them disenfranchised by floating bread and circuses in front of them. Everyone knows more about sports scores and celebrity fashion haunts than the do about the voting record of the legislators who are spending their tax dollars, or who supports their legislator. There are countless stories about the sacrifices that come from making political struggles, and the kids are educated subtly and directly not to participate. And so is it any wonder that they retreat in irony to the Dennis Millers and David Lettermans, who basically suggest to them every night that the only thing worth developing is a hip, ironic attitude, where you believe in nothing." A grounding in a liberal arts education is important in learning what it means to be a human being, Coyote said, but the message is no less important at any institution of higher learning. He cited a study that showed most leaders to be optimists while most pessimists are correct, over time. Coyote pointed to Vietnam, nuclear power, environmental issues,womens rights, alternative medicines and food. Changes in those areas generally came against the wishes of elected officials, and those struggles need to continue. 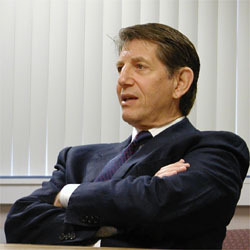 "Im still maintaining that tradition and being a spokesman for it and pass it on to the next generation," Coyote said. "That not only is the struggle not over, its not hopeless. Things change and we need to be part of it." Marin County's Peter Coyote is the only American in the delightful French comedy Bon Voyage, and to this unsophisticated ear, his French sounds as good as that of co-stars Isabelle Adjani and Gerard Depardieu. Coyote learned to speak the language in his 40s, when he got the notion of someday spending part of the year in Paris. Just because he's fluent, though, doesn't mean he had no problems making the movie. For more reviews and info on this film, visit our Bon Voyage film page. May's installment of "The Active Opposition", hosted by Peter on LinkTV, will feature a discussion on the forces that are influencing our current military and foreign policies, and how the growing military budget is changing priorities for America at home. Peter and his guests will examine how the redeployment of our military since the fall of communism reflects our shifting national interests amidst new threats from different corners of the world. Broadcasts will be on May 11 and 12. Peter has been cast in the USA Network's new (limited) sci-fi series, The 4400. Other cast members include Joel Gretsch, Jacqueline McKenzie, Michael Moriarty, Laura Allen, Chad Faust, Kaj-Erik Eriksen and Mahershalalhashbaz Ali. Created by Scott Peters (The Outer Limits), and with executive producers Francis Ford Coppola, Rene Echevarria and Maira Suro, the series kicks off with an apocalyptic ball of light sailing toward earth. In place of the expected catastrophic event, however, the projectile lands harmlessly, discharging thousands of returned abductees left with no memory of their otherworldly experiences. The 4400 people of various nationalities and walks of life have been missing for periods ranging from several months to over 60 years, but yet they haven't aged a day. Lead character Tom Baldwin and his new associate, Diana Skouris, must investigate whether these "4400" hold the key to the planet's destruction or its salvation. Peter will play Tom and Diana's boss, Dennis Ryland, a Vietnam vet described as a multi-layered, complex man, trying to keep the governmental paranoia over the 4400 at bay, while trying to figure out what happened to them. Screenwriter Peters says the series is "more about what happens when people's lives are interrupted in an extraordinary way. How do they go about putting themselves back together? How do they deal with now suddenly being part of a new minority? How will (some of them) reconcile the fact that almost everyone they knew has lived their lives and are now gone, but they haven't aged a day. What if you were Rip Van Winkle? 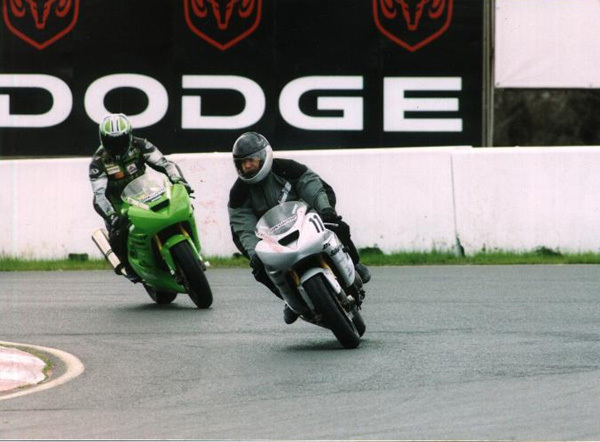 And of course there will be other strange phenomenon the 4400 are going to have to deal with. They've been changed in some way while they were gone and these changes will slowly being to manifest themselves." Yves Simoneau is on board to direct the production from March 15th thru April 9th in South Vancouver. The network has ordered six episodes (including the pilot) of the hour-long series, due to premiere this summer on USA. Coyote sent along some recent photos, taken on February 24th. 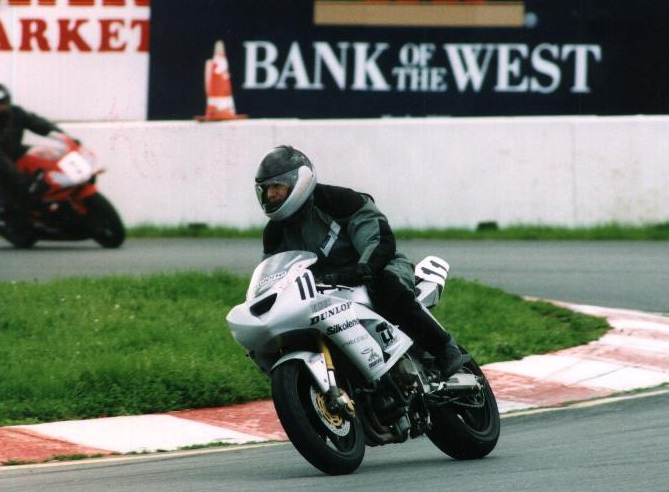 As you can see, his interest in motorcycles has not waned through the years. 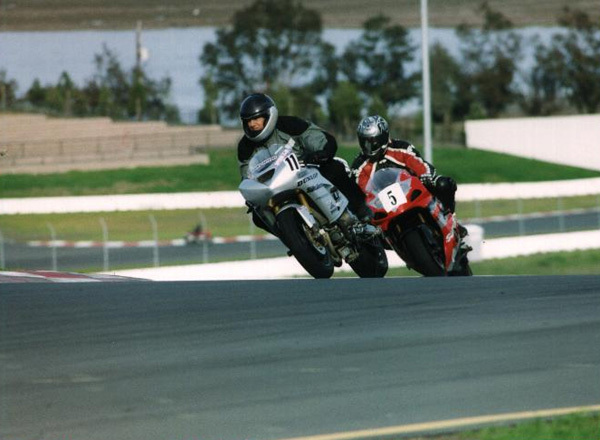 All suited up and looking good at the Keith Cole Superbike School at Sears Point Racetrack in California. A documentary narrated by Peter called "Hollywood's Magical Isle: Catalina" premiered at the 9th Temecula Valley International Film Festival in September. Beginning with William Wrigley's acquisition of the Santa Catalina Company in 1919, the history of the island is told through archival footage, stills, interviews of residents, historians and celebrities. Through the remarkable eye of first-time film director Greg Reitman, the viewer embarks on an armchair adventure through time and nature in this captivating exploration of Hollywood's private playground. Peter's French film, Bon Voyage, starring Gerard Depardieu and Isabel Adjani, will be opening in LA and NYC on March 26th. Last year Peter was back in France filming Le Grand Role, directed by Steve Suissa, and now release dates have been set for September 8th in Belgium and October 20th in France. Here in the U.S. Shadow of Fear (aka Main Line) will open on July 14th. There's a new link on the Archives page to vimalasangha.org. This web site belongs to Coyote friend and Zen teacher, Lew Richmond. The Vimala Sangha was formed in June 2003 by Lew and a group of senior practitioners in the Shunryu Suzuki Zen lineage. Its mission is to teach and practice the traditional teachings of Zen Buddhism in the context of modern American householder life. Last week the third Tibetan Film Festival was held in St. Paul, Minnesota.on March 5-11. Among the films and documentaries shown was Dreaming of Tibet, produced by Will Parrinello and John Antonelli and narrated by Peter. The film, which explores the cultural challenges faced by Tibetans living in exile, has been shown at several film festivals. It includes appearances by His Holiness the Dalai Lama, actors Richard Gere and Goldie Hawn and author/climber Jon Krakauer. As many of you know, Peter narrated two of Carlos Castaneda's books - A Separate Reality and The Teachings of Don Juan. Indican Pictures is releasing Carlos Castaneda - Enigma of a Sorcerer, a film which offers an insider's perspective on the man Time Magazine dubbed "Grandfather of the New Age Movement." Select book narration by Peter will be included in this documentary. It will be released in theaters in the USA and Canada this spring followed by a home video release on VHS and DVD. Here are a couple more photos taken at the Miami Film Festival. 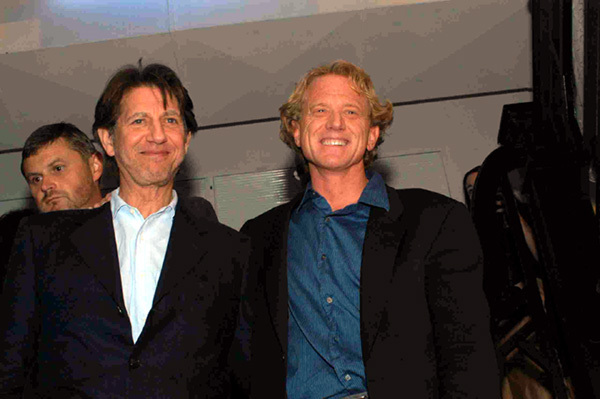 The left one shows Peter with Jamie Redford (yes, son of Robert Redford), who made his directorial debut at the festival with Spin. Peter says he and Jamie are old pals who used to play music together. The right photo shows our Coyote man with Bon Voyage director, Jean-Paul Rappeneau and co-star Virginie Ledoyen.